We hung around at the Devon farm Airbnb longer than usual, in part, because I needed wifi in order to checkin to my British Air flight 24 hours in advance and change my seat assignment, which as I suspected was a middle seat. (One of the annoying things I discovered about BA is that you can’t pick your own seat without paying $38, more than 24 hours before departing — a bit obnoxious for a round trip flight that cost over $1000…or in my case lots of credit card miles.) But I was happy to kick back, enjoy the lovely breakfast hamper that our host Sarah delivered to our cottage door with fresh homemade granary bread, multi-colored eggs from her chickens, raspberries and strawberries from the garden. Dirck and I wandered around the farm, past the sheep and “rescue chickens,” the fruit, veg and flowers in the garden, the wood fence and beyond, a bucolic valley of fields stretching far into the distance. In the church cemetery across the road from our Airbnb, we found a 19th century headstone for a “Betsy,” which was surprising since I rarely see my name anywhere, let alone in England. I also had a nice chat with our 34-year-old host who recently quit city life and a city job i to buy the old farm, fix it up and start the Airbnb (which despite its remote location gets guests from Europe, South America and us Yanks). The three Airbnbs we’ve stayed at in England were excellent! Part of it may be that I am getting pretty good at picking and I don’t go for the dirt cheap ones (if they even exist) but beyond that, the English hosts seem to be particularly good at hosting and providing a good approximation of the English country life admired by anglophiles like me. Our drive home was longer than expected, in part because we got waylaid for an hour (argh) in and around Exeter when the nice big A motorway we were on suddenly became a town center traffic jam. We ended up getting out of it by taking another smaller A road in the wrong direction and then having to take a series of tiny no-letter/no-number/high-hedged lanes that often seemed to lead nowhere useful but eventually did. We were amazed at the variety of roads we traveled on during a short drive and how close they were to each other, from a multi-lane motorway, to a two-lane (barely) road to a high-hedged lane. In Dorset, we drove in and out of West Bay, where the TV show Broadchurch is filmed, long enough to see the back of the big sandy beach cliff where some dramatic scenes were shot. Way too many tourists. Fortunately my friend Marion had mentioned a lovely little Dorset village nearby where she stays, Netherbury, so we sought refuge there. If only it had a pub. By the time we got to the larger town of Beaminster nearby, the pubs weren’t serving lunch any more so we ended up a a little bakery cafe for a few savory tarts. To get back to our friends’ house in Mortlake, we pulled out the “Sat Nav” which was a big help. (Most of the time I relied on an AZ book of road maps Francine kindly lent us.) Driving in residential southwest London is not easy. The windy streets are narrow and confusing but with the help of “Tracy” (our friends’ name for the Sat Nav voice) we made it to the Mortlake house and even found a parking spot (several actually) in time to have dinner one last dinner with Una. This morning, without Tracy’s help, we gave ourselves extra time to drive the rental car to Heathrow and even though I’d made several screenshots of the google map to Heathrow, we still made a few wrong turns. Fortunately a woman walking her dog at 7:45 a.m on a Sunday morning helped us and we were soon out of the tangle of neighborhood streets and onto the M4, heading to sprawling Heathrow, where we eventually found rental car return signs (near terminal 4 and 5 for future reference) and gladly returned our car. Heathrow was packed thanks to the start of the school holidays so I was glad to have 2.5 hours of time. BA flight attendants were on strike, which affected our service (no second meal although the first one included a surprisingly edible Chicken Tikka, scant ice for the drinks, a non-functioning computer map and iffy movie reception). A few nice touches — free newspapers available before stepping onto the plane so I loaded up on the Times and the Mail (The Observer wasn’t offered but fortunately I’d already bought one.) Goodbye England. I’ll be back. It took awhile for dirck to adjust to driving on the “wrong” side of the road, with a left hand stick shift (or gear shift as the Brits say) not to mention very narrow roads but we made it here to lovely Lyme Regis, on the Jurassic coast in Dorset where we are staying at a sweet little studio apartment Airbnb way up on a hill overlooking the bay. We walked down the hill after arriving around 5:30 p.m. to the sound of seagulls and took the coastal path which has glorious views of the high grassy dunes lining the shore on the distance. The colors of the sky, shore and sea are stunning, all pale blues and tans plus vivid green and huge pink hydrangeas popping out everywhere. The coastal path leads along the shoreline past a rocky beach and a sandy beach where people were swimming to the town center with narrow streets rising up from the water, lined with old storefronts. We walked through a gorgeous terraced garden above “the Cobb” — the high sea wall that juts out into the water, made famous by the novel The French lieutenant’s Woman.” I was here 30 some years ago but hardly remember the place. And I think it’s changed a lot. We splurged on dinner at Hix Oyster and Fish, said to be one of the best Dorset restaurants. It’s in a glass walled modern room (almost Scandinavian feeling) of a house next to the terraced gardens and overlooking the bay and Cobb. We had lightly battered oysters, baked creamy crab and shared Lyme Turbot, beautifully served on a rough dark wood board, with a delicious seaweedy type green, and finished with a small scoop of house-made raspberry sorbet. We walked through the quiet town and way up the hill to our Airbnb (6 charmouth close) feeling happy to be here. Earlier we,stopped briefly in the pretty market town of shaftsbury, where we had a basic ploughmans with local country ham at King Alfred’s, in a low ceilinged timbered room and admired the valley view from the pretty gardens near the town’s elegant abbey. Filed under b&b, England and U.K.
Portlandia nails it with B&B spoof! that demonstrates exactly why men in particular have a hard time staying at bed and breakfasts! Especially men traveling solo. We women traveling solo don’t have as much problem with them. I can’t stand cloying interiors or overbearing hosts but I do like the prices and often the ambiance and convenience of B&Bs. 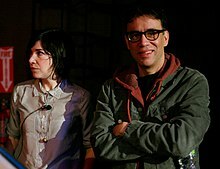 Carrie Brownstein and Fred Armisen, stars of the show. The DM Register’s story on Iowa B&Bs today mentioned some I hadn’t heard of before. One in particular caught my eye because it’s in a town I like to visit – the pretty Northeast Iowa river town of McGregor. The place is Stauer House Bed & Breakfast. I last visited Evelo’s B&B about 15 years ago and was pleased to see it’s still around (less pleased to see that the price of a room has doubled – from $45 to $95). It’s in a good location, on a quiet residential street in the Lowry Hill area, near the Walker Art Center, Lake of the Isles, and Uptown (although that neighborhood has lost its scruffy arty charm since we last visited.) From the street, the three-story, turn-of-the-20th-century B&B is unexceptional looking – and there’s no sign indicating it offers lodging. But step inside and you’re in an impeccably preserved Victorian parlor with the original heavy dark oak woodwork, period furnishings, stained-glass domed lamps everywhere, and carefully arranged collections of American pottery. It’s more classy, than fusty, fussy, or frilly – the work of sophisticated collectors with a very good eye. The dining room walls were stenciled by hand with a Tiffany pattern of tall cypress trees modeled on the interior of Istanbul’s Topkapi Palace (which I visited in, um, 1982.) We only know this because we asked the proprietor, who gladly (but only briefly) filled us in. She appeared to have a speak-when-spoken-to policy that some might consider aloof but we appreciated. We saw her a little when we arrived and a little at breakfast before we left. Otherwise we were on our own, which is how we like it! I almost forgot to mention the rooms – all three of them. They’re on the upper floors, more casually furnished than the main floor – with shabby chic bedspreads and distressed furniture – not a teddy bear in sight. More like staying in a cheerful room in grandma’s attic, complete with creaky wooden floors and a narrow staircase. You do have to share the one bathroom – which can be awkward, especially in the morning when you may encounter strangers also tiptoeing toward the shower. Co-existing with other guests at a B&B reminds me a bit of Kabuki-style choreography – listening for sounds outside your room, those telltale footsteps in the hall or water running in the bathroom; peaking out the door to see if the bathroom door is ajar; making a break for it and closing the bathroom door softly but firmly; and feeling relieved – until you remember you have to exit the way you arrived.